Since 2008, MPIP has conducted research to increase our understanding and inform our recommendations to improve transparency and credibility in clinical trial publications. In 2010, a roundtable of editors and industry representatives mapped persistent and perceived credibility gaps when reporting the results of industry-sponsored research and identified Ten Recommendations, including improving authorship disclosure, the focus of this research initiative. In 2012, we launched our Authorship Research Initiative to identify challenges when recognizing authors of industry-sponsored publications and to develop a standardized authorship framework to facilitate decision making and improve transparency in this regard. The Authorship Research Initiative focuses on Recommendation 5 of the Ten Recommendations which calls for improved disclosure of authorship contributions and writing assistance and continued education on best practices to end ghostwriting and guest authorship. What are common authorship ambiguities and how are they resolved? 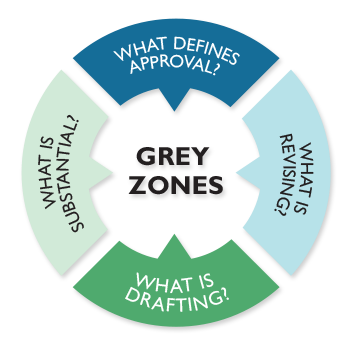 Seven "Grey Zones" representing persistent or challenging authorship scenarios when interpreting ICMJE guidelines were identified through discussions with professionals involved in clinical trial publications. These were converted into 7 case studies. 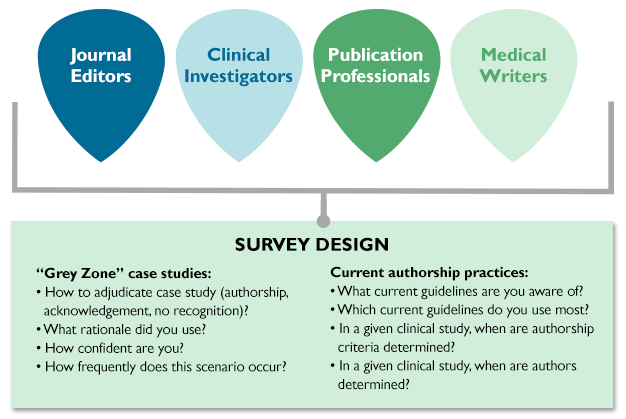 MPIP, in collaboration with academic researchers, then surveyed clinical investigators, journal editors, publication planners, and medical writers to better understand how they would adjudicate the real-world authorship challenges represented by these 7 case studies. Respondents were asked to report the frequency with which each scenario occurs, their confidence in their survey responses, and their awareness and use of current authorship guidelines. MPIP collaborated to create a new authorship framework for decision making. We discussed the results from the survey’s 498 respondents at industry–journal roundtables in the United States and the United Kingdom and with clinical investigators. The insights from these discussions culminated in the development of a Five-Step Authorship Framework designed to improve transparency in disclosing contributors to industry-sponsored clinical trial publications. This standardized approach can be used prospectively to facilitate more transparent and consistent authorship decision making for clinical trial manuscripts. We shared high-level findings at major publication conferences, including the Seventh International Congress on Peer Review and Biomedical Publication and the 9th Annual Meeting of ISMPP in 2013. Full results and recommendations were published with open access in BMC Medicine and were presented at industry/academic conferences in 2015. Marušić A, Hren D, Mansi B, et al. Five-Step Authorship Framework to Improve Transparency in Disclosing Contributors to Industry-Sponsored Clinical Trial Publications. BMC Med. 2014;12:197. This authors’ guide to submission "best practices" for manuscript preparation and submission, with a particular emphasis on industry-sponsored clinical trials, was developed through a unique collaboration of MPIP co-sponsors and journal editors. The toolkit, which addresses Recommendation 4 of the Ten Recommendations (Educate authors on how to develop quality manuscripts and meet journal expectations) was published in Current Medical Research and Opinion in 2010. It was also translated into Chinese. Chipperfield L, Citrome L, Clark J, et al. Authors' Submission Toolkit: A Practical Guide to Getting Your Research Published. Curr Med Res Opin. 2010;26(8):1967-1982.